My husband Lulu loves madeleines. It always reminds him of our trips to Paris. I haven't made any in so long, I thought it was time to surprise him with a fresh batch. 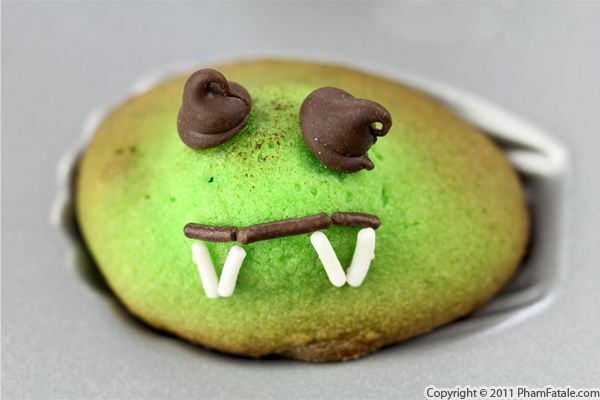 I made the madeleines Halloween-friendly by giving them a green color and decorating them with Halloween-themed designs. Pandan is my green food color of choice, and I've flavored and colored a lot of French desserts with it in the past. Most of the madeleines I've had in America are flat, dry and not very tasty, so I wouldn't be surprised if you're not a fan. The authentic French version must have "the bump" (follow the recipe and you'll find out the secret for fool-proof madeleines) to be truly fluffy and tasty. 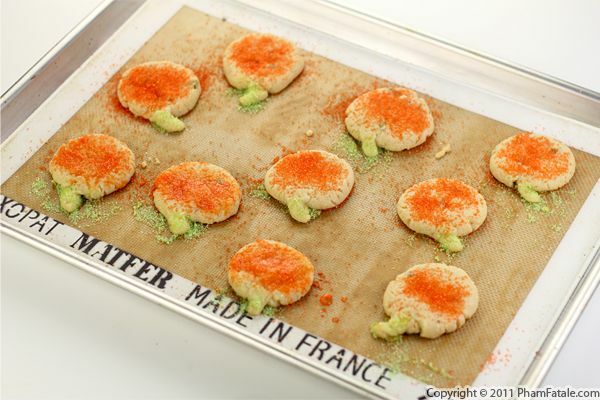 It creates a light and delicate gourmet cookie that is so pleasant with a hot cup of tea. 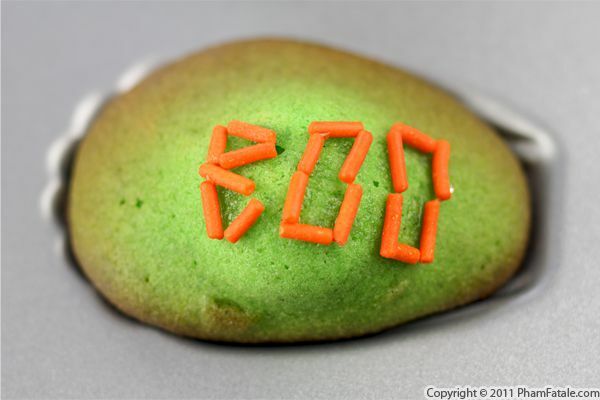 Not to forget the kid-friendly part, I decorated the madeleines with sprinkles and chocolate chips and wrote spooky messages that for sure will satisfy both big and little kids! And Lulu is most definitely a big kid. He still loves taking his kid sisters trick-or-treating so that he can raid their bags of candy later on. Maybe with these madeleines in the house, he'll stop stealing their sweet treats! I read this morning in the news that the White House held a pre-Halloween party that included cookies and dried fruit today. It inspired me to make a batch of dried fruit cookies for our own festivities. I mixed raisins, dried cherries, dried kiwis, dried apricots, honey and pecans into a basic sugar cookie dough. I made a fair number that I kept in an airtight tin so the kids can enjoy them all the way through to Monday evening. 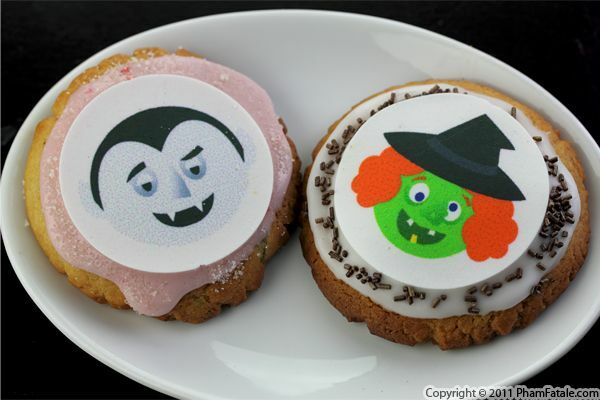 The cookies are decorated with very cute renditions of Dracula and a spooky witch. The designs are in the form of peel-&-press edible frosting stickers, which were very convenient, given my utter lack of drawing skills. If you'd like to get similar designs, you can find them at Ticings®. They come in thin sheets of edible icing using food-grade inks that easy apply to almost any soft-frosted dessert. Our team at PhamFatale.com has worked hard and has prepared almost $1,000-worth of giveaways for the month of December just for you. Ticings® will be part of it, so you can add holiday art to your classic baking. Stay tuned! 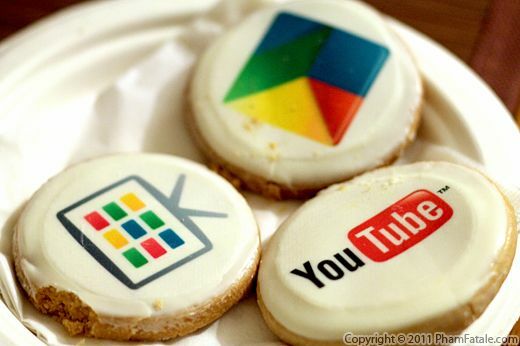 Finally, there are Google cookies that we can all enjoy regardless of our privacy settings. :) My husband smuggled these out of the 2011 Google I/O Conference after-party so that I can share them with you. Plates of these treats emblazoned with YouTube, Google TV and Chrome (I think) logos were gobbled up by hungry geeks along with many other sweet and savory snacks. It might sound strange, but in my opinion, making cookies is like making risotto. What I mean is that in general, you shouldn't use too many chunky ingredients to accent the cookie dough. I typically make use of whatever I can find in my pantry, and this time I limited the additions to coconut toffee peanuts and M&Ms. The M&Ms came from a package of goodies from Rutgers University. My father-in-law was inducted into Rutgers Hall of Distinguished Alumni a few years ago and has stayed close to the school. 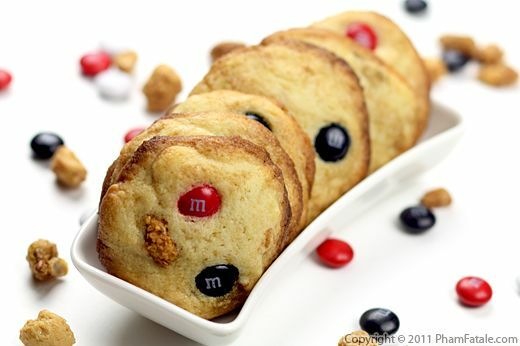 The colors of the Scarlet Knights are faithfully represented in the M&Ms, and I think they add a nice touch of color to the cookies while showing off some school spirit. Thanks, Dean McCormick!